Every day I think of how fortunate I am to be a photographer! I get to capture the moments that become your memories. I get to watch families unite & grow. You allow me to watch your spirits and families. You let me in on some of the most intimate times of your life. All of these events are what makes my "job" so worthwhile. As I begin my 5th season on Main St in Chatham, I am grateful with the clients that become my customers and vice versa at Three Buoys. I get to watch the ebb and flow of my 2 businesses and I have you to thank. Just a few weeks back my season began. It is an ever changing economic world and I am thrilled to be thriving in both businesses. This is not to say it comes easy- I certainly have to put the extra effort forth to sell a unique product in my companies. This is challenging and I have always had a competitive side, thank goodness! I made the long haul(just joking) off Cape to Concord MA this week. Jim flew in from California for a PUG meeting. I heard him speak in New Orleans in November at Pictage's Partner-CON and loved the enthusiasm he delivered. I was so fortunate to attend and I just booked my ticket to go back again this year!!! This week he was talking about supply vs. demand in the photo world as well as standing out amongst the crowd. He gave great advice on being out there shooting, creating and as well as being accountable for all your actions in the work place and personally. With each conference I attend I like to walk away with at least one thing that will help improve my business, there is always at least one new thing to learn!
" There is nothing anyone knows that they did not learn from someone"
So get yourself out there, talk to people, network, get to know who you are in your field. At home. In life. Continue to be that person no matter who you surround yourself with. here is a recent picture of myself & my "three buoys" who continue to inspire me every day! One of the best perks to having my own business is that I get to choose whatever charity, cause etc that I want to donate my time & energy to. 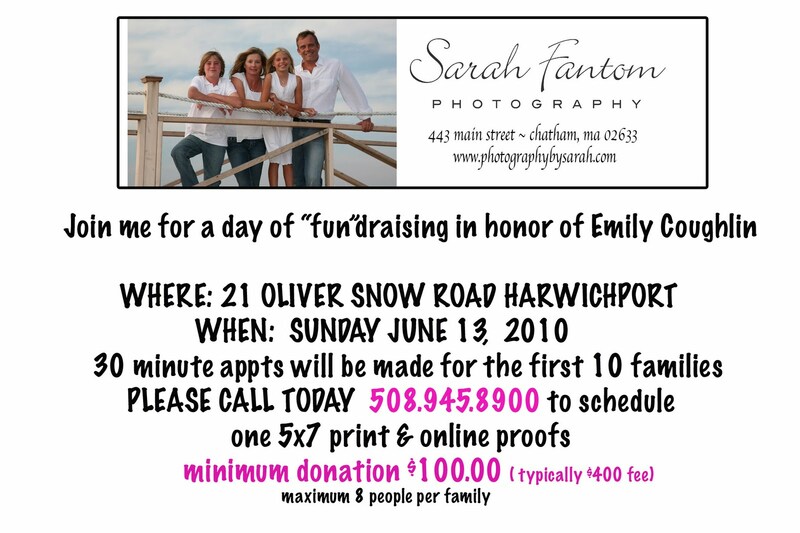 This year I am hosting a "fun"draising event in honor of a most courageous little lady from Chatham. Emily Coughlin has been fighting Stage 4 Neuroblastoma for over a year and in June will celebrate her 5th birthday! I am fortunate to know her family and I could not be more pleased to be able to offer any amount of time & support to this beautiful family! You can view the photo promo piece attached and contact me if you would like to be involved in such a fantastic event.